Located in Newberg, Ore., Wolcott Design Services is a small job shop that specializes in design and prototyping for the sport racing, electronics and outdoor equipment industries. Bob Wolcott owns and operates the company and oversees daily management and operation of the facility with the support of one operator. When Wolcott looked to grow the business through the addition of production machining capabilities, he knew that he needed faster processing, quicker changeovers and more flexible workflow management than what his three current vertical machining centers could offer. After diligently searching the market for a solution, Wolcott decided on a Makino a51nx horizontal machining center. He selected the machine for its high-speed, high-power spindle, rigid construction and precision along all axis extremities. The machine’s horizontal orientation allowed greater fixturing flexibility, accommodating more parts per setup, less frequent changeovers and unattended capabilities. With an automatic pallet changer, the company can improve utilization rates for more productive hours. 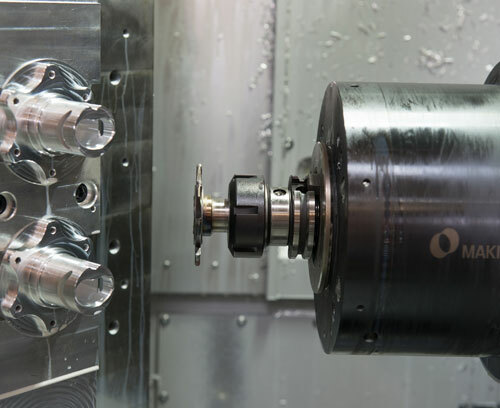 Following the a51nx investment, Wolcott replaced one of its previous verticals with a PS95 vertical machining center to handle the company’s high-mix, one-off prototype orders. The PS95 uses a similar spindle design to that of the a51nx, enabling higher metal-removal rates than previous equipment. In addition, the machine would allow for exterior access to the tool changer for uninterrupted machining. Prior to Wolcott’s investments in volume production capabilities, prototype orders represented 80 percent of the company’s total business. Since then, prototype work has continued to grow but now represents just one-third of the business. The company is capable of easily producing batch orders of 10,000 parts or more. The improved efficiency afforded by the a51nx has enabled Wolcott to produce batch orders of 10,000 parts or more parts complete with spindle utilization rates of up to 85 percent. The company has also built on the machine’s unattended capabilities and single setup processing by optimizing its labor activities to have one operator simultaneously manage the a51nx and a nearby vertical. With the rigidity and thermal stability of the PS95, Wolcott is capable of maintaining positioning accuracies within 0.0003 inches in the X-axis and 0.0003 inches in the Y-axis. Overall part consistency has improved with repeatability as tight as 0.0001 inches. Parts run on the PS95 are being produced 50 percent faster than previous technologies on average, and in some processes prior metal-removal rates are exceeded by 400 percent. Total combined efficiencies of the a51nx and PS95 have enabled Wolcott to be more competitive in quoting new jobs with 15 percent lower costs compared to global competitors. Its customers also benefit from immediate local service and on-the-fly production of test parts.